There is not a US Embassy or Consulate office in Medellin. Like in any country, you are supposed to carry your Passport with you as identification, but in reality this is often not done in Colombia for fear of having it stolen. 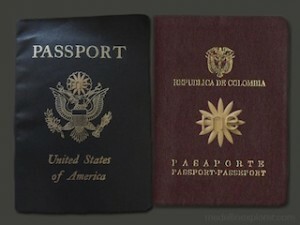 Many travelers carry copies of their Passport, and it is often common to ask an immigration official to stamp the copy you are bringing with you to carry as evidence that it is real and when you were allowed to enter. An Entry Visa is not required for US Citizens. When you arrive you are generally allowed to stay for up to 60 days unless you have made other arrangements or are traveling on a Visa. But this is determined by the immigration officer on arrival, and 30 day or 90 day visas are common. For Colombians to travel to the United States a Visa is required. And it can be near impossible to obtain if the applicant can not demonstrate to the consular official at the interview that they have sufficient ties to Colombia that would compel them to return. The presumption is that the applicant intends to stay illegally, and the applicant must convince them otherwise.